What’s this? I asked the waiter, pointing to what looked suspiciously like a piece of a chilli. It’s a chilli, he confirmed. But it was in my coffee, I replied, raising what little of the voice I still had in a question. Yes, he said, nonplussed, it says so on the menu. We’d stopped in to the ever-so-awfully-posh New York Café for a cup of coffee, just because one of us hadn’t been there before and I figured that three years of boycotting the place (almost to the day) after my first and only visit was long enough to hold a grudge. For all its faults [price, service, attitude], it’s a beautiful space. 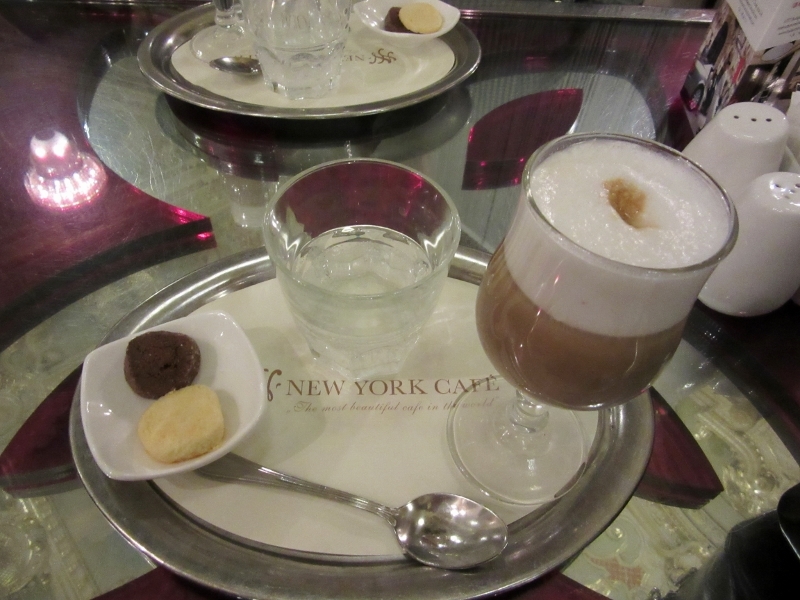 I spotted a Magyar Kavé on the menu – a Hungarian coffee. A new one on me. I read a little further. The ingredients: Tokaji Szárasz Samorodni (a dry Tokaji wine), méz (honey), eszpresszó kavé (espresso coffee), and csípős tejhab (spicy milk foam). I’ll have some of that, I thought. Hang the expense. Wine and coffee together? Could life get any better? It tasted strange, but good. And I kept drinking. And then I bit on something that, on closer inspection, looked a lot like a chilli seed. And then came the chilli. And then I called the waiter. Chilli? In coffee? I asked, raising my eyebrows so high they hit the exquisitely ornate ceiling. Yes, says he, defensively, it says so on the menu. Really, says I, damn sure it didn’t as I’d already transcribed the entry. May I see? Well, not really, he said – it just says spicy milk foam. I don’t know about you, but when I think spices for coffee, cinnamon or nutmeg come to mind, not chilli. It’s been a long, hectic, mad week of literary talks, play readings, workshops, logistical nightmares re flights and visas, and lost voices. I’m still speaking in croaky whisper, ignoring the phone as I can’t talk loud enough to be heard. But when I add last night’s pumpkin parade to the discovery of Magyar Kavé, I’m grateful that after eight years, this city still regularly surprises me. Wine and coffee, in the same glass. Who’d have thunk it? If you buy a coffee in the States these days, the “spice” will be pumpkin. It is Hungary, the land of paprika, so that would be “the” spice to expect, I guess…. (but an actual pepper I do find a bit unusual (something you only expect in a Fish Soup)). Cinnamon or nutmeg spices in your coffee? Clearly, like me, you are someone over 35. I even remember a time when no one drew little pretty pictures in my milk foam, and “barrister” was only *not* a job description, it was even much less so a career path…..